You would not want to part away from your charming smile even if you are on another continent. 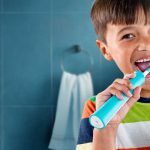 If that is even near the truth, you should be looking up the web for the best portable water flosser for travel. Or, you can just relax – because I have already done the research for you. Just grab yourself some good time and move through this insightful piece (sigh!) of compilation where I have reviewed every small detail that is relevant to you. My research has been based on some throughput well-built water flossers that are ideally suited for travel. The results were simply beyond the roof. I looked through many water flossers from several manufacturers. These have been made for the traveling audience specifically. They are still a decent size, have long lasting batteries, hold generous volumes in the tank and are adjustable with the voltage. 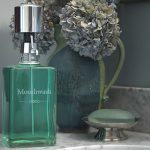 I will you about all these briefly in the buying guide attached to this article. From my own experience, I would advise you a cordless water flosser. But it’s an individual choice anyway and I will give you the reviews of the top 5 water flossers in the market. Let’s get started with this. 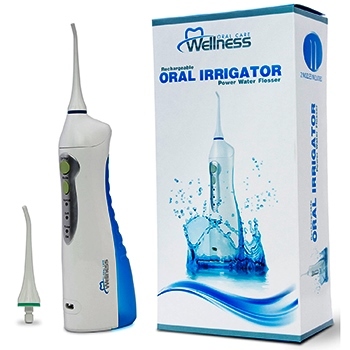 There are many oral irrigators that are also water flossers. The rechargeable H2ofloss® is definitely one of those. You can clean both clockwise and anticlockwise with the H2ofloss®. It generates a high volume of pressure, one among the highest in the segment. In our tests, it performed amicably well and we back most of this claim. Apart from that, you have six different settings for speed. You can use it at almost any angle you deem fit. The real plus of the H2ofloss® is in its size. It is barely the size of a cellphone and you may carry it anywhere when traveling. This also makes it a very travel-friendly device. It generates 1200 pulsating movements every second and gas a PSI of 5-110. The frequency is not the highest but is easily one of the most effective that will work hard for you. The combination of pulsations and pressure works well below your gumline as well. Combined action of pressure and pulsations. Cleans both clockwise and anticlockwise. Cleans below gumline as well. 1200 pulses generated every minute. Pressure may seem too strong initially. May require the help of a nasal tip. 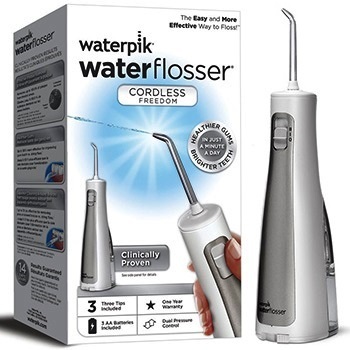 If you are trying to start with water flossing newly, the Cordless Freedom from Waterpik is the most effective aide you can choose. You just use it for one minute every day and the results are there to see. 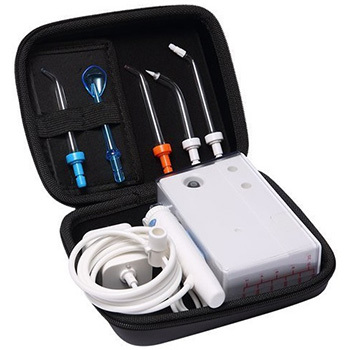 The great design of the battery-operated flosser is portable and highly suited for travel. There are 3 AA batteries that come included with the device.You may also consider making this your choice if you have a small bathroom. The device can be used in the shower too. We tested this personally and even after a dozen uses, there was to instance of leakage. There are three flossing tips in the Cordless Freedom that cover the three different areas of your mouth. 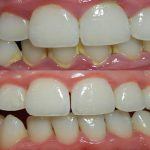 The pressure at which water is shot can be controlled with two distinct pressure nodes.It is better to start with lower pressure if you are new to water flossing. And as the name implies, you may use it cordless too. Best deal >> Waterpik Water Flosser, WF-03, White Here! 3 floss tips, 2 distinct pressure modes. Cordless function, great for travel. 2 jet tips, 1 orthodontic tip. Included travel plug and 3 AA batteries. Both speeds are very high for starters. Water flow not perfectly streamlined. The FC-10 has been designed for travel. If you are someone who travels a lot and is highly attached to water flossing, the FC-10 could be a serious mate for you. There is advanced control feature integrated with the device and it generates 3000 pulses every minute. This is a great product for you if you are generally upset with the bacteria and the debris that have accumulated just below the gumline. This is also one of the basic water-flossing tips you can make use of. 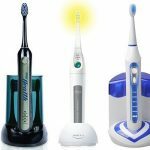 The number of pulsations in the flosser varies between 1600 and 3000 courtesy of three distinct modes in the toothbrush. For beginners, even 1600 is a high scale to start with. However, if you are a traveler, you should already be accustomed to high-pressure water flossing by now. This makes it a great companion for travel that works at ample speed. 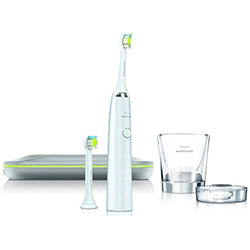 The cordless slim design of the oral irrigator facilitates easy storage. 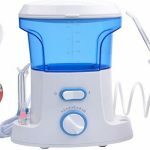 Best deal I found on the Wellness FC-10 Professional Ultra High Powered Oral Irrigator! Works well with implants and orthodontics. 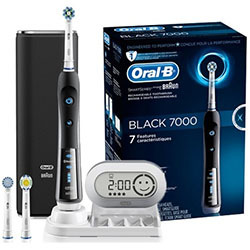 High range pulsations for better plaque control. Brush head quality not up to the mark. Charge dock has limited life. 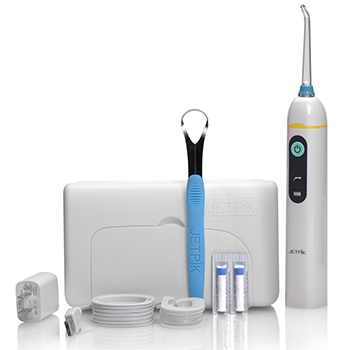 The Jetpik JP50 is among the few devices out there that guarantee plaque removal with every use. For the sake of figures, it takes plaque removal higher by 240%. But in actuality, it feels a whole lot more. Since it has a compact size and form factor, you may easily carry it when you travel. 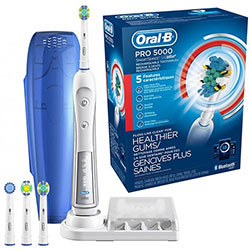 When compared to a manual toothbrush, it removes twice as much plaque. That is a great feat if you are still using a manual toothbrush. The gum-action of the JP50 is also quite impressive. Jetpik gives you a total refund if you are not pleased with the action. You can use the two modes of the toothbrush: sonic toothbrush and water floss in succession. However, a slight disappoint is that you do not get a reservoir with the flosser. You may guy an external glass or attach the irrigator to a traveling hose. New mobile kit, very easy operation. Compact size, great for travel. Seven day refund on non-satisfaction. Needs additional counter top unit for home use. Jet too strong for the start. The EW-DJ10-A Portable shows a lot of promise at a very low price point. You get quite a few features that catch the eye right at the outset. The design is totally collapsible and the toothbrush fits very neatly into any travel bag. This makes a great travel gift too. The EW-DJ10-A Portable has sufficient power to give you performance where traditional flossing cannot reach. This is actually one of the best features of the flosser. The pulsations of the EW-DJ10-A Portable work at two variable speeds and vary between everyday use and high speed. The lower speeds are implemental for children and if you have sensitive gums. You can easily fill up the 5.5 ounce reservoir. This gives you even longer sessions right between those fills. Since it is totally waterproof, you may quickly and easily rinse it. All you need is warm or running water to clean it. 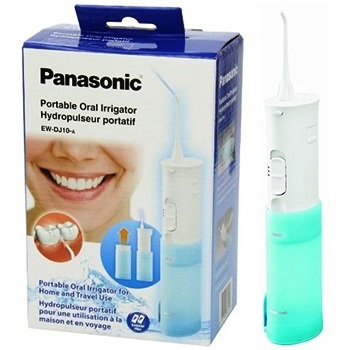 >>Click Here For More Information About Panasonic EW-DJ10-A Portable Dental Water Flosser on Amazon! Cordless with two different speeds. Easy cleaning with running or warm water. Does not support rechargeable AA batteries. Battery cover is soft, prone to damage. What characteristics you’ll for look when buying a portable water flosser for traveling? This is the no-brainer really. Whenever you are looking for a product that will be great for travel, a convenience size a must. It is all the more important for a water-flosser because it gets difficult to reduce the size of devices that have intricate functions. This is where you will have to be careful about the section. A cordless flosser is a solution when you are trying to water floss in a moving vehicle or even in an unequipped environment. If there is a lack of power source, you should be able to use this feature to your advantage. However, this should also be supported by sufficient battery performance. Proper battery life is an essential feature of any equipment that has been designed for travel. If you are going outdoor camping or backpacking, you will have to ensure there is decent battery life. Also, an extended battery life means you will have to carry the flosser less to and from the bathroom. The reservoir or the glass in which the water is held is a very important part of the device. The higher the quantity of water held in the device, better is the performance of the device. The volume capacity of the reservoir also determines the pressure with which the jet works. It is a great plus if the voltage of the flosser is adjustable. Since you intend to use the flosser while you are traveling, there is a great chance you will not find uniform voltage facilities around all conditions. You can afford to have more variety of options with adjustable voltage when you are traveling. 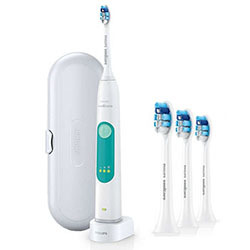 What makes the Waterpik Cordless Freedom Water Flosser, WF-03, White a better choice than the rest? 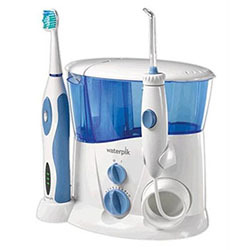 The Waterpik Cordless Freedom is a great water flosser that comes with 3 floss tips and 2 pressure tips. There are very few other models that can boast of this. Without compromising on size or effectiveness, it also packs in a comfortable cordless function. The cordless function of the motor makes it a great travel companion. It comes with an included travel plug and 3 AA batteries. That is really the deal for the price. 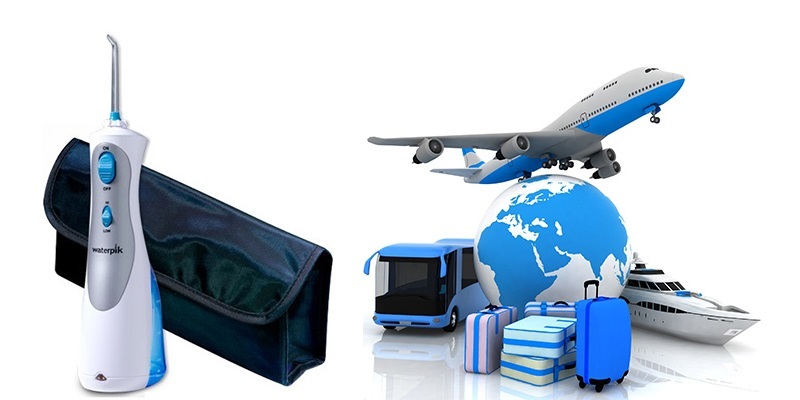 A water flosser for travel is one that gives you a distinct advantage while traveling. We hope out top-5 pick will help make the decision simple for you.